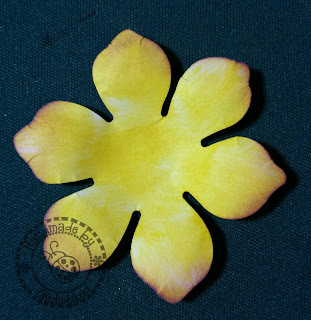 Okieladybug's Scrap N' More: Flower Making Made Simple....NOT! 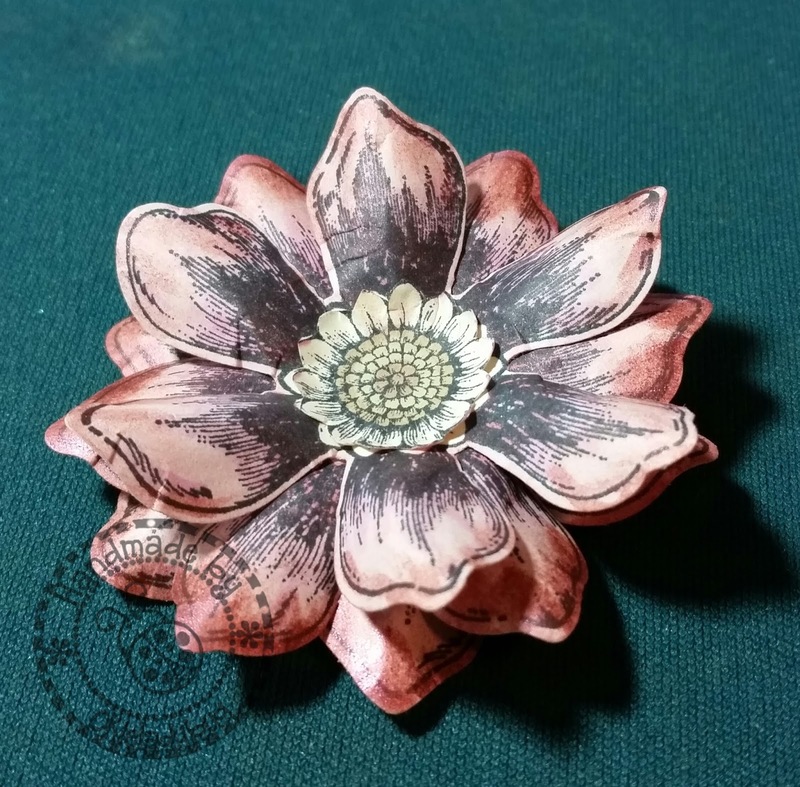 I was skimming Facebook groups over the weekend and came across a post in a stamping group that I am in, think it is called Stamping Enablers or something like that, and some lady showed some flowers she had made and I immediately fell in love. She said something about Heartfelt Creations and I went immediately and found the website and started looking around. I signed up for the newsletter and they sent me a 25 minute video that showed how you could make like 5 different flowers with the same stamp and die set. Since I have quite a few Stampin Up flower stamp and punch sets I figured all I needed was a tool kit. The video made it all look so simple to make gorgeous flowers. I priced the tool kit on Heartfelt Creations and since I wasn't sure I would be able to do the techniques I got on Amazon and looked for a flower making tool kit. 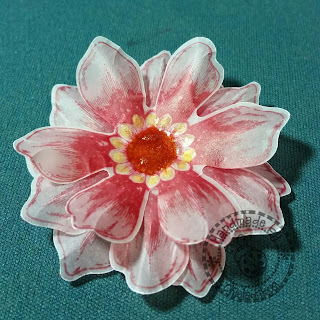 I came across the McGill Paper Blossom Took Kit and thought I would get it since it was cheaper and like I said I wasn't sure if I would even be able to pull off such gorgeous flowers like that were done in the video I watched. I pushed the buy button and quickly got my email saying my order had been placed and when I got my shipping notice it said I would receive my package on Wednesday. Much to my delight I got a text on Tuesday saying my package had arrived, a full day early, but I was out of town at the time at my aunts house and waiting to get home reminded me of how it felt on Christmas Eve waiting for my dad to get off work so we could open presents. Oh the anticipation!! Sadly my first attempt looked like something that had been left in the rain for a few days. I know I did a sloppy job of coloring it. I actually tried to use my Stampin Up inks and a watercolor brush but the ink ran and I used Memento but then I remembered I usually use Stazon for this purpose. I was feeling a little discouraged at this point but it was late and I knew I couldn't give up on the tools and the lady in the video said it would take some practice. Little note on me, I don't like to practice...I like to do. I like to do and I like to do well. If I can't do well then I don't want to do at all. I decided to go to bed and work on it the next day when I got home from work. After I got home from work yesterday and fixing me a t-bone steak for supper, my doctor told me to cut down on carbs and so that is all I had for supper but that is for another post, I decided to just practice using the ball tips and punched out just a plain flower and I did use some chalk ink to color it a bit so I could fool myself into thinking it wold look like a flower. When this one didn't turn out so well I decided to go back to the video and watch again. 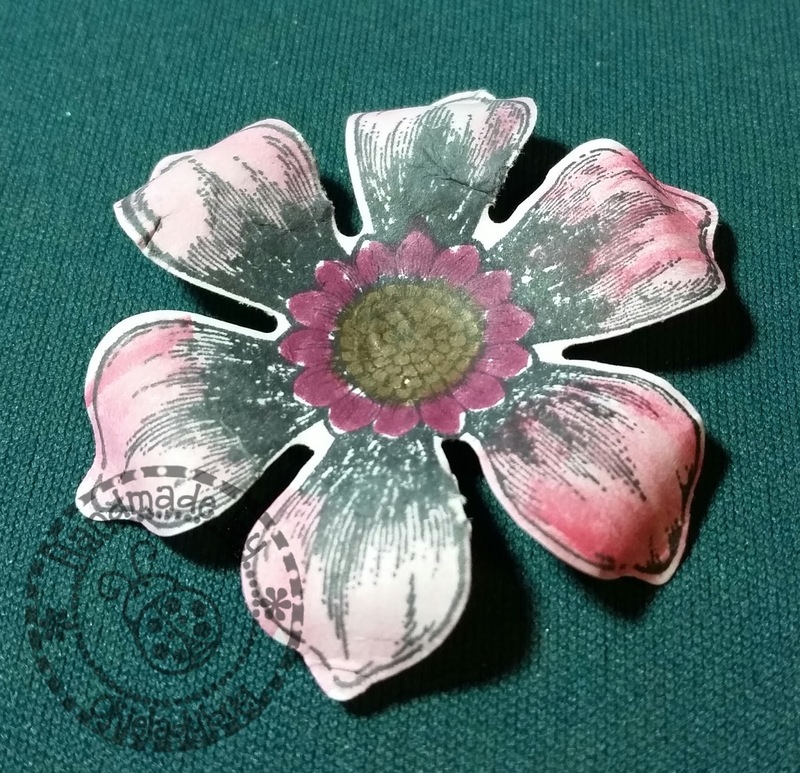 I stamped off some flowers using some Rhubarb Stalk Memento Ink on some dusty rose colored paper and punched them out so I would be ready to follow along with the video. I was more pleased with the results this time and felt a little more confident that maybe I didn't waste my $12.70 on the tool kit. I wanted to see how well a vellum flower would do and stamped and punched some out of the vellum. 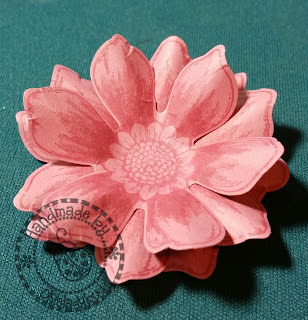 In the video the lady had used white embossing powder on her flower and it was gorgeous but I was having a bit of lackadaisy attitude after a long day at work and because it was a practice flower I went the simple route. Most likely it would have turned out better had I not changed the type of flower I was trying to make half way through. I added a bit of Glimmer Glaze in the center of the flower to color it up a bit and since it was an experimental flower I might as well go all out and really experiment. For my final practice flower I resolved to take my time and think of this as a flower for a project. I stamped on white paper and used my ProMarkers to color the flower. I added some Perfect Pearls on the tips of the petals and for the center I cut it out of a flower I had stamped and then even did some little technique the video lady showed on small pieces. FINALLY! Once I got done with this flower and looked at it I realized I have a new love...FLOWER MAKING! The only problem now is that I want all the flower and die sets that Heartfelt Creations sells! Okay maybe not all but I would like to have a few. My trip to Florida is coming up and I need to save money for that so I won't be ordering any of those awesome kits until I get back so until the I will have to work with what I have on hand. I know I will need more practice but I a quite certain I will eventually get the hang of this and it will become a new obsession! It may not be simple but, they sure are beautiful. They just come to life. Wow they look great Your practice paid off as each one you posted they got better and better. 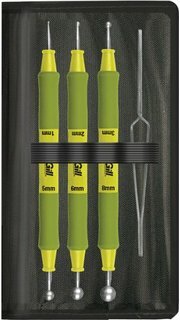 I have the tool kits too but haven't used it for a while. Bravo! The flowers look fabulous. I am now convinced that you are successful at EVERYTHING. Your combination of talents and sheer refusal to fail serve you well. I enjoy making the flowers too, however, they do take a while to complete, so i really don't make them very often. It does take practice and watching the videos. I want the new owl stamps and dies. Awesome! You did a great job! I have worked with flowers before, but have not done the stamped variety. I love the detail look from stamping. Thanks for sharing! Okie, I am glad that you didn't give up! The dimensional flowers bring projects to new levels. I have painted letters, jewelry boxes ect and then used dimensional flowers on for accent. I don't like to buy flowers pre-made - these look much nicer on a project. Best of luck - I can't wait to see what you have made! Heartfelt has beautiful everything. I have quite a few of their flower dies and paper pads. They take time and practice. Emma Lou (the creative director) does tutorials for the different flowers You can purchase Heartfelt Creations from Stamps Alive at discounted prices. Knowing you it won't be long before your flowers will look as good as the design team projects. Also look at Susan's Garden flower dies. I think they are Sizzix but not sure. Lots of flower making videos when you search for Susan's Garden. Have fun. I love doing flowers. I love Heartfelt Creations. Join their platinum club if you plan on purchasing a lot of things. I wish I had the first time I ever bought anything from them. My sister joined & saved a lot, especially when they come to conventions. They have bundle specials. They will be at scrapbook expo in grapevine tx later this month. Join then if you go. I am so glad to hear there is someone like me - in a hurry and the first time out wants it to be picture perfect! Then, once it's perfected, you want it ALL! Thanks for the tutorial, too! Beautiful flowers but why not use your Cricut to cut out flower shapes? You can find a lot of SVGs out there and you certainly have the talent to make the shapes for different flowers. You are amazing with creating shapes.